As you may know, my family owns The Barn at Springhouse and we coordinate events and weddings there! It all started as a Garden Center (Springhouse Gardens) 22 years ago, and just recently (2 years ago) after my wedding became an event venue also! We host all kinds of parties and events, but one of my favorites (duh) was a couple weeks ago when we hosted the Lexington Bloggers! 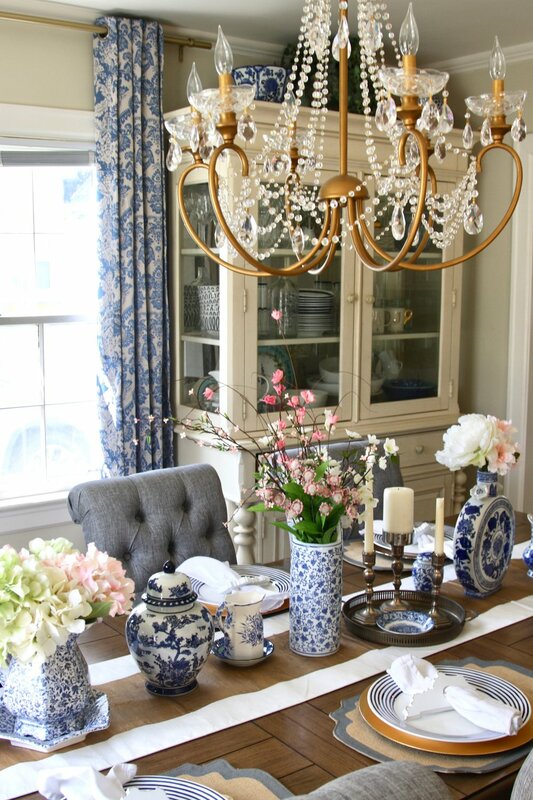 I wanted everything to be very chic & bohemian, so I went to Pinterest for some inspiration! I had seen pallets used as tables before, so I started searching, "pallet picnic" and found some great ideas. From here, I scavenged my own house and my mom's house (Thanks Mom!) and came up with the basic layout and style for the table. 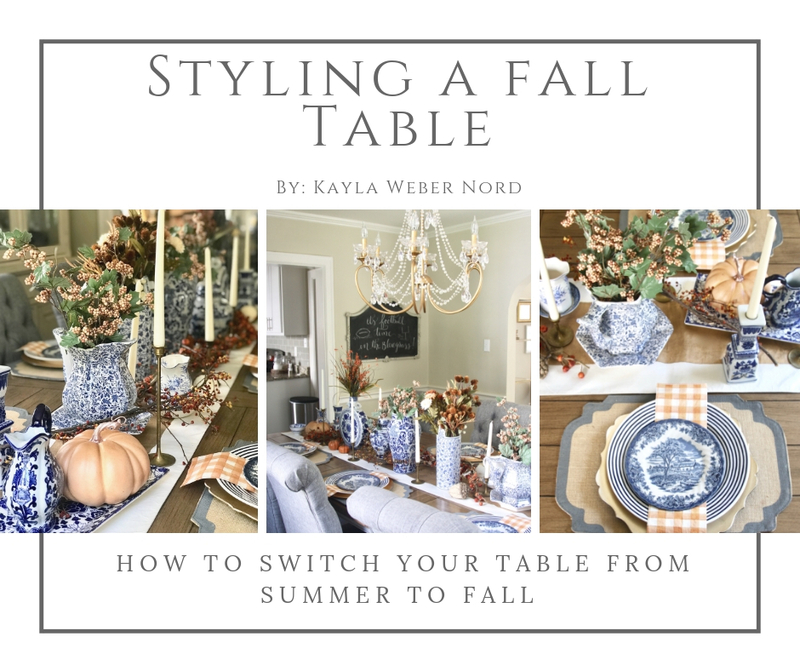 I have come up with a list of necessities to help you style your own pallet table, or even your dining room or outdoor picnic table! To make the table high enough, but still Moroccan style, we stacked (who I am kidding-- John and my Dad stacked) 3 pallets on top of each other and in a row to make one long table. We used 15 pallets. I made sure to put the prettiest and best quality pallets on top, aka I annoyed John until he put the correct one where I wanted it. LOL. From here I began arranging the placemats in a random order around the table. 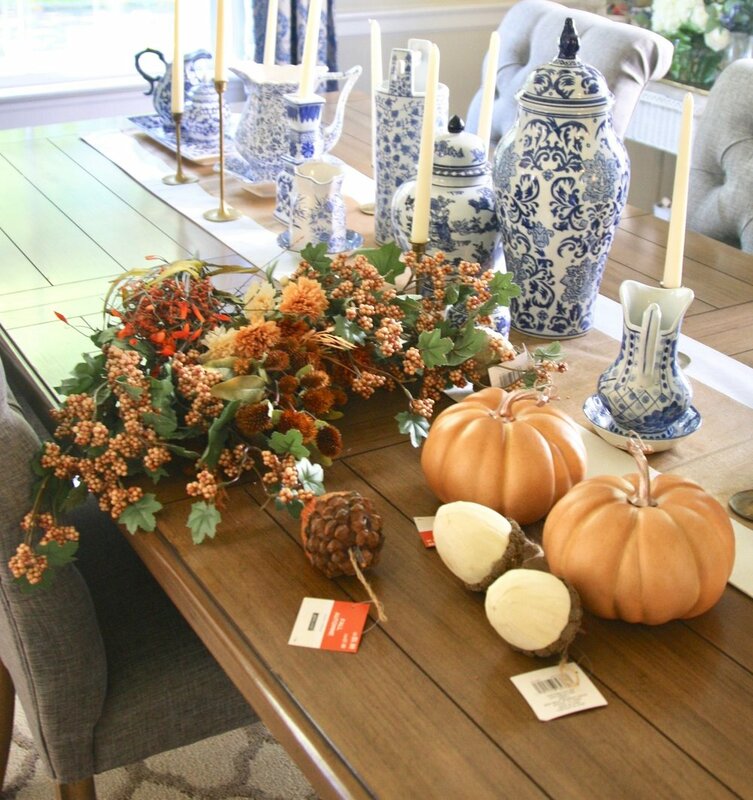 Since there were 21 of us, I had to mix and match neutral placemats from my Mom's collection and my own, but it worked due to the bohemian feel of the table. Next, was the greenery that my Dad cut from the Katsura tree. We laid it sparsely across the table in both directions to act as the runner. In the meantime, my Dad was also cutting random flowers from the garden and my Mom was arranging these flowers in our Ball Mason Jars! Trader Joe's flowers would also work if you don't have an abundance of gardens around and a really cool Dad & Mom who are basically florists! LOL! 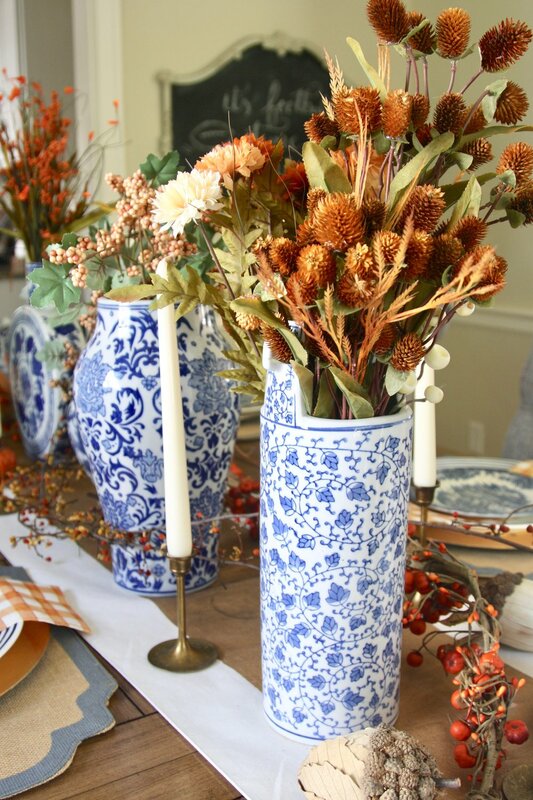 We put the candelabras and candlesticks on next, placing them evenly throughout the length of the table, and then scattered the doilies around these, to add a little extra texture. As my Mom finished each flower arrangement, we put these on the table in between the candlesticks. 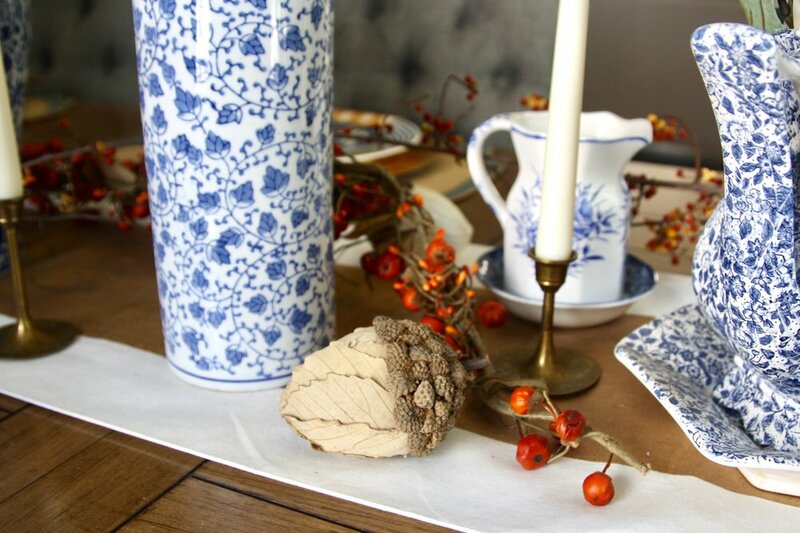 The finishing touches for the table were the votives and extra tiny vintage dishes that we placed around randomly. The key is to balance everything, but not to overthink it, especially because we were going for the bohemian look. 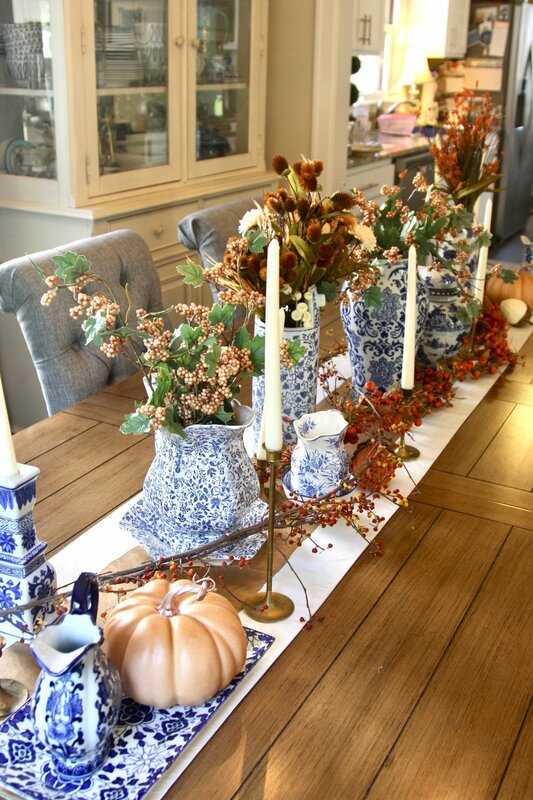 Once the table was complete, I began putting the place settings together. We brought white plates and gold silverware. Half the silverware was John's Grandmother's and the other half was from Miss Molly Vintage! Finding 21 cloth napkins was a struggle, so we mixed and matched some neutral and patterned ones. As an extra touch for the place settings, I painted a picture of The Barn a week before and had prints made to go on top of the plates. This was part of each person's place setting which I set on top of the napkin and then placed their name card on top of that. The final touch was the name place cards that I made the night before. I grabbed a pack of these white tags here from Michael's and used this beginners calligraphy pen here (also from Michael's). I had all the names written out (I just wrote in cursive with that pen- nothing fancy) and found some thin lace ribbon from Michael's, similar here. I cut lavender, sage, and rosemary out of my garden (about 25 sprigs of each). When I got to The Barn, I began cutting the lace ribbon into about 8inch long strips. I used the lace to tie a sprig of lavender, sage, and rosemary onto each name card. I placed one of each of these on top of my barn print, on top of a folded napkin, on top of the plate to create our place settings! For a brunch -- I mean -- bunch more (LOL) on our #SpringhouseBloggerBrunch check out this list of AMAZING Blogger's that attended and their individual posts about our brunch! Special thanks to all the vendors who contributed to our special goodie bags: Shop Local KY, Miss Molly Vintage, AJ Apothecary, Shop Twenty, Morton James, Springhouse Gardens, Whole Foods Lexington, and Kentucky Yarnbirds. Our brunch was held at The Barn at Springhouse in Nicholasville, Kentucky. All photos taken by Kirstie Dunston Photography unless noted otherwise.